Abdominal Migraine: What Causes Abdominal Migraines? The International Headache Society defines an abdominal migraine as an idiopathic disorder seen mainly in children as recurrent attacks of moderate to severe midline (center) abdominal pain, associated with vasomotor symptoms (hot flashes, flushing, night sweats), nausea and vomiting, lasting 2-72 hours and with normality between episodes. A headache does not occur during these episodes. An abdominal migraine occurs mostly in infants, toddlers, children, and teens. Most children with abdominal migraines will develop a migraine headache later in life. An abdominal migraine is rare, but not unknown, in adults. 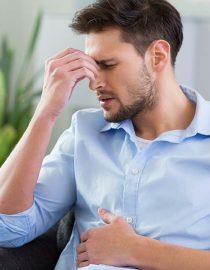 Other disorders are ruled out first, such as irritable bowel syndrome, lactose intolerance or reflux before an adult is diagnosed with an abdominal migraine, which can take several years. Abdominal migraines are usually diagnosed at the age of 3-10 years. Early studies by Cullen and MacDonald found that childhood abdominal migraine typically evolved into migraine headaches in adulthood. Several studies have linked abdominal migraine to migraine headache in later life and a family history of migraines. Children with recurrent abdominal migraine are at risk of impairment of their social and educational development, which places a significant burden on community’s healthcare resources. It isn’t visible what the cause of abdominal migraines are. Some researchers believe that it is related to neurologic and endocrinologic (hormonal) changes and may be caused by shifts in serotonin levels. Genetics may also be involved as an abdominal migraine is found in children whose families have a history of migraines. What Are the Symptoms of Abdominal Migraines? At least five attacks of abdominal pain, fulfilling criteria B-D.
Midline location, periumbilical or poorly localized. Dull or “just sore” quality. Pain can be severe enough to interfere with normal activities. Children may find it challenging to distinguish anorexia from nausea. Dark shadows under the eyes often accompany pallor. In a few patients, flushing is the predominant vasomotor phenomenon. It is a good idea to keep a headache journal to keep track of what foods were eaten and if an attack occurred afterward. Identifying and avoiding food triggers will help to lessen the frequency of attacks. There is little evidence available to base recommendations for the drug management of abdominal migraines. The small amount of literature available suggests that the antimigraine drugs pizotifen, propranolol, and cyproheptadine are effective prophylactics. Colocynthis – obtained from the fruit of the bitter apple; it is used for relieving headaches, stomach pain with nausea and vomiting, facial neuralgia, and acute abdominal pain accompanied by diarrhea. Is helpful if there are sharp cutting pains. Pulsatilla – this plant helps to treat painful indigestion, nausea, diarrhea, and car and motion sickness. Helps if stomach pain is caused by eating rich, fatty foods. Magnesium phosphoricum (phosphate of magnesium) – is used as an anti-spasmodic remedy, treats the cramping of muscles with radiating pain. Helps with cramps and diarrhea. Bryonia – obtained from the root of the plant, it is used as an anti-emetic. Can be used if the pain is worse from heat or the slightest movement. These wristbands provide natural relief from nausea through acupressure. The pressure points P6 (for adults) and H7 (for children) are often targeted. Pericardium 6 or P6 (Nei Guan) is located three finger breadths below the wrist in the inner forearm and between the two tendons. It is commonly used to relieve nausea, upset stomach, motion sickness, headaches, and carpal tunnel syndrome. Heart 7 or H7 (Spirit Gate) is located at the ulnar end of the distal wrist crease when the palm faces upward. It works well for treating children’s anxiety, nervousness, and nausea. Peppermint oil is a natural way to treat nausea. This can be achieved by rubbing a few drops onto the abdomen, putting a drop on the wrists to soothe nausea and motion sickness, or using an essential oil diffuser to inhale it. Sipping on a cup of ginger tea can help relieve nausea. You could either buy a good quality ginger tea or boil slices of ginger root in water with some lemon and honey for several minutes.